The British Library says the initiative is a "21st century Domesday Book"
A "21st century Domesday Book" - a snapshot of the United Kingdom seen through e-mails - is being compiled by the British Library. The library is asking everyone in the UK to forward an e-mail from their inbox or sent mail box representing their life or interests. Alternatively, people can submit a specially-composed message. 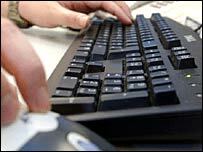 Each eligible e-mail received in May will be recorded and used to create the library's E-Mail Britain archive. The British Library has joined forces with computer giant Microsoft in its attempt to collect millions of e-mails. John Tuck, British collections head at the library, said: "E-mail Britain will allow us to archive a vast snapshot of our present-day e-mail communications and will be of great value for future researchers. "Digital archiving of e-mail has never been attempted before on this scale and we're very excited to be capturing such a rich slice of contemporary life." The e-mail address for those who wish to take part is email@emailbritain.co.uk.